The advantages of starter strip shingles might just surprise you. In fact, they’re a crucial but constantly overlooked part of any roofing system. Without them, your rooftop might be subjected to lost shingles, which is a waste of material as well as an annoying drag on the finances as you end up needing repairs before the situation can worsen. Starter strips stop these issues before they get a chance to occur in the first place! Starter Strips: What’s the Purpose? Starter strips are commonly overlooked, because many contractors use shortcuts instead, opting for cut-up shingles as starters. While this might seem more convenient, these stripped shingles are not designed to be used in this fashion. As such, they might not have the right adhesives in the correct places to be effective. This may lead to poor wind resistance, and materials can be picked up by strong gusts that trickle into gaps allowed by poor adhesion. Pre-cut starter strips are a cost-effective alternative that will help lock your shingles into place, keeping them from being detached by strong wind. Beyond that, they’re easy to install and involve no cutting of the roof itself. What Features Make Starter Strip Shingles So Useful? The right strips can get the job done, with Dura Grip™ Adhesive keeping roof edges down, protecting them at their most vulnerable points. Tests have proven that starter strips prevent shingle loss and water leaks, which grants you extra peace of mind moving forward. Starter strips also have an aesthetic payoff, as they keep roof edges neater and straighter. Why Do Homeowners Need It? Without starter strips, shingles placed near the roof’s perimeter could create a channel through which wind can travel, if strong enough. There could also be gaps that may be susceptible to water leaks, which lead to damage that can be both substantial and expensive to get fixed. 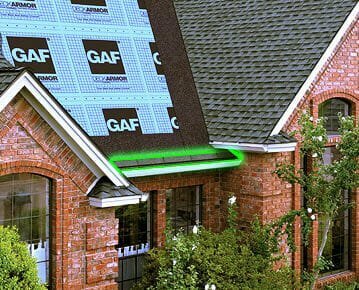 Starter strips keep those air and moisture channels covered, helping to waterproof the roof deck while also keeping shingles from blowing off. Starter shingles can be extremely useful and crucial to the well-being of your rooftop, but only if they’re used properly. Take the uncertainties out of the equation by using a provider you can trust! At Hopewell Roofing & Restoration, we use only the best materials, and our team of HAAG Certified Roofing Inspectors will get the job done right, all with a warranty in place to give you the peace of mind you deserve. Connect with our expert roofing team at Hopewell now for your free consultation or to learn more about the benefits of starter strips for you roofing system. Provide a cost-effective alternative to using cut-up shingles as your starter course. Include a high-quality, properly positioned adhesive that will tightly lock your shingles in place to help prevent blow-off. Be easy to use and install, with no cutting on the roof. Looks Better: Straighter roof edges and no messy black cement dripping onto your new white edge metal. Best Performance: Factory-applied Dura Grip™ Adhesive helps to lock down the roof edges at the eaves and rakes. Peace Of Mind: GAF tests show that using starter strips at the eaves and rakes helps to prevent blow-offs and potential leaks. Superior Warranties: Shingle & Accessory WarrantyGAF offers increased wind coverage on many shingles when you use starter strips. They are also covered by up to a Lifetime ltd. warranty when installed on Lifetime Shingle roofs.